I’m so excited! I just discovered that my favorite magazine of all time, Victoria (by Hearst Publishing) is going to be published again! It was first published in 1987, I believe, and they stopped publishing it in 2003. People buy the old copies on eBay, as well as hardcover books that range from decorating to poetry to Christmas to recipes to…well, there’s lots more. What they all have in common are the wonderful photographs! I don’t know if you were already aware of Victoria magazine, but I wanted to spread the word! I figured what better place than a blog, that also has photographs. I know I read a blog & like a picture & click on it & get taken to another blog sometimes & one thing leads to another, and hours have gone by! There’s almost nothing more relaxing, than to sit back one evening & find that your Victoria magazine has arrived, so you can thumb through it at your leisure! I went to the Hearst publishing site to see if there was a list of the various “Victoria” books, and lo and behold, there was a message that they were going to start publishing it again! I’ve already entered my subscription, which will begin with the Nov/Dec issue, to be mailed out in October 2007. I had to stop and think of who I know that might enjoy this magazine (my effort to help “up” the interest in the magazine!) I thought of you, so here I am! * I want to thank Leslie for letting us all know about this new update. I LOVED Victoria Magazine, and I am very excited about it’s return! It is exciting that they’re reviving Victoria. It was such a favorite mag that I never understood what was behind them closing it in the first place. I too LOVED Victoria magazine and have already sent in my subscription too. I look forward with much anticipation for it’s arrival. OH…MY…GOD…I bought every issue of Victoria magazine ever published! And I still have every single one! I am so excited to learn this news! Thank you Thank you THANK YOU! I bought a Christening gown and coat from 2 different vendors found in a Victoria Magazine article back in 1993-1995. Since my grand daughter was born in Dec. 1994, I’m thinking that it had to be about then. I am going crazy trying to find a back issue and have tried ebay. Another grand child is on the way and I wanted to buy from the same company. Who knew? I’ve done some research for you, and have found this company. I hope it’s the one that you are looking for! 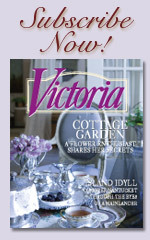 Thank you so very much for sharing the information concerning the relaunch of Victoria Magazine. I always considered Victoria the most beautiful and artfully inspired magazine I have ever seen. After they stopped publication I scoured local thrift shops and used book sellers to snag every copy I could. Thanks for sharing, you’ve made my day! LadyLaura – You’re very welcome! I am excited to get my new issues as well. I think the publishers have heard from enough subscribers about what they liked & started not to like about the magazine – that will help them start up with a bang! I heard about this awhile ago and immediately went and subscribed. I loved that magazine. She has awarded “A Storybook Life” with a “Nice Matters” award! You can check out her post & see who she gave the other awards to as well. Weird why it wouldn`t before. Maybe it`s my crazy computer! Anybody know if the quality is up to Nancy Lindemeyer standard? The mag was pretty sad by the time it ceased publishing. If they don’t do it right, I’d rather they not do it at all! my favorite magazine of all time. i am so happy to see this magazine make it’s return. I’m so happy to hear that Victoria Magazine is coming back. Can’t wait! Don’t you all want to attend the Victoria re-launch party in Dallas September 21-23? Go to the Hoffman publishers website and click at the top on Events. The number to call for reservations and hotel rooms is right there. I’m going and hope to be able to talk directly to the editors about content. They are very aware, I’m sure, of what they need to accomplish to regain their loyal readers — any mistake would be fatal as the membership is very focused and unique. Hope to see you in Dallas. Thanks for the information. I just bought a new subscription. My old magazines are all worn an ragged from reading them so much. This gorgeous magazine 1st caught my eye on a ferry going to Vancouver Island,BC Canada. I clung to it while I raised 4 boys, it was beauty and serenity when my everyday life was not. I cried at how the stories, photography, and even the paper it was printed on became shoddy, after Nancy Lindemann left as editor. It was watching something beautiful die. OH PLEASE do a go job on the revived VICTORIA! Sorry that you’re having some trouble with your subscription. Why don’t you take a peek at this link, as it provides all of the contact info for Victoria Magazine. I have been following the interest in Victoria magazine and would like to add my comments as a fan, an occasional contributor, and now as the author of one of the newest Victoria books: Flower Style, Arrangements for Every Occasion. I had the privilege of searching the archives of the original Victoria photos to select my favorite floral designs. Working with these photos gave me the opportunity to present the designs in a new format. Readers can now create these seasonal arrangements for their own homes (each is presented with a list of flowers, supplies, and easy to follow directions). I am thrilled that so many readers are as pleased as I am to see Victoria back on the newsstands!